Learn the essential vocabulary. 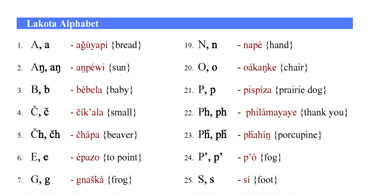 Use your copy of the New Lakota Dictionary or the New Lakota Dictionary Online to learn words that native speakers would use in their everyday conversation. Learn key phrases - sentences that are frequently used by native speakers. Just being able to communicate in the most basic of terms can give you a sense of accomplishment and motivation. 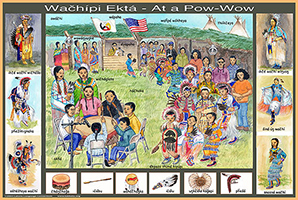 Visit Lakota Language Forum to find other students to practice with by writing to each other or forming conversation groups in your area. For those with speaking as a primary goal, focus on pronunciation. LLC provides audio CD's to accompany their text and picture books that will help you hear each words proper pronunciation. The Lakota Berenstain Bears, available for purchase on DVD and on YouTube, also provides a chance for listening and learning. For those with reading or writing as a primary goal, focus on grammar and orthography becomes a priority. LLC has useful tools for the study of both subjects. 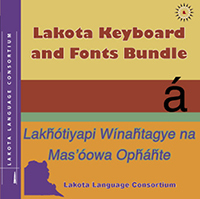 In addition, LLC also offers the Lakota keyboard and font package that make writing easier for all learners. Keep practicing! Even in self-study you can measure your progress. Record yourself to check your pronunciation. Write a story or letter and have a friend on the forum proofread it. LLC's picture books and see how well you do. In order to stay motivated in your language study, it is best to set achievable targets or goals and put them into a reasonable timeline. How about you aim to be conversational in six months? Or be able to ask directions in three weeks? Or talk about your life and your work in two months? Or order food in the language by the end of the month? Be specific and realistic about what you want and when you want it. Once you have a decent timeline and plan for your study, it's time to focus on your priorities in learning the language. Do you want to be a fluent speaker? Are you more interested in being able to read the language to learn literature and history. Do you wish to be able to write in your chosen language? Make your passion the intial focus of your learning. You will find when you have mastered your passion that other parts of the language come more easily when you turn your focus to them. Before you even learn how to say "hello" in a new language, you must examine your reason for wanting to study that language. Knowing why allows you to focus your study and set goals. People study languages for many reasons: to learn more about another culture, for travel, to develop their minds, for the challenge, or, in the case of many indigenous language users to learn more about their own culture - to discover their roots. Why do you want to learn? As you progress in your learning, you may be tempted to pass academic judgements on your progress and ability. This is a great way to undermine yourself. You can't achieve perfect fluency in just a few months of self study, but you can achieve basic competency and build on that as you expand your study and get the opportunity to practice in real world situations. Even simple communications are great achievements. The only way to "fail" is to not try at all. A great way to measure your skill level is to practice speaking, reading, listening and writing with others. 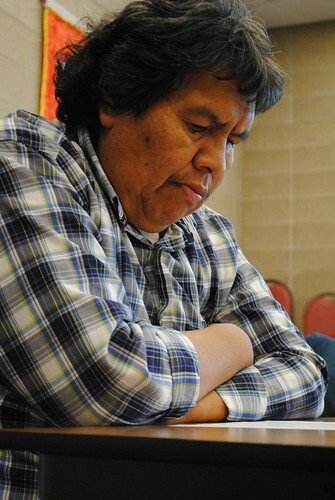 LLC provides a great environment to do this at the Lakota Summer Institute, an intensive training seminar held each June at Sitting Bull College in Ft. Yates, North Dakota. To read more about LSI, visit the official website. Lakhótiya Wóglaka Po! - the Speak Lakota! 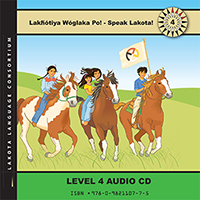 series of Lakota language textbooks are designed for elementary and secondary school use and self-study. 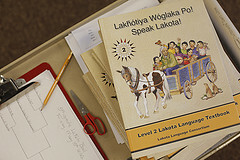 Developed by leading Lakota language authorities and linguists, the textbook is the first linguistically and pedagogically consistent textbook in Lakota. .
Our Speak Lakota! Audio CDs are the audio components of our textbooks. They provide an important tool for work on word pronunciation and phrase inflection. The CDs are useful for students as they learn to form good language speaking habits. Available for Levels 1-4. Each level of textbook has a complementary set of flashcards. They can be used to contextualize the vocabulary though images and illustrations. The flash cards are full-color, laminated, and large enough to be effective in a classroom or in self-study. Available for Levels 1-4. LLC now provides the means to create Mac and PC compatible computer keyboards in a set of 12 adhesive keyboard labels. LLC has also included six Unicode compatible Lakota fonts in this package. 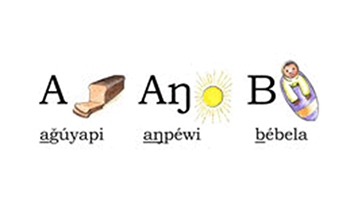 The LLC Lakota Alphabet Strip is an important visual-aid, accurately presenting the Lakota alphabet for daily lessons and instruction. 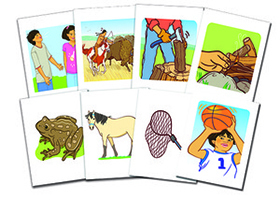 Like other LLC products, the alphabet strip contextualizes Lakota sounds and letters through memorable images and illustrations. LLC Educational Posters include large poster-size reproductions of important pages from the textbooks as well as posters that teach specific terms such as body parts or items of clothing. These posters help reinforce vocabulary and can be used in association with instructional activities and games. Ready to get started! This simple download will be a great reference tool for your studies. 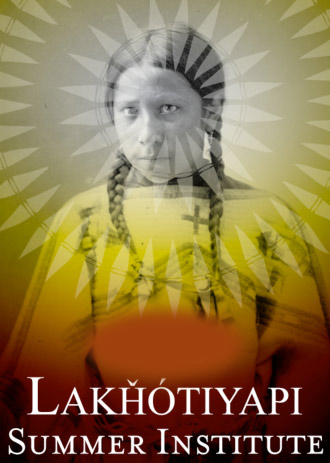 This free download is our gift to you as you undertake the study of Lakota language.